It’s just heavenly. 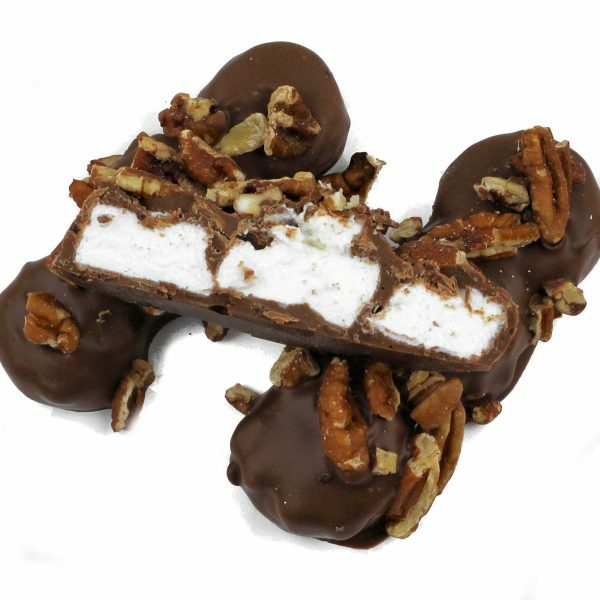 Fresh marshmallows drenched in milk chocolate and sprinkled with pecans on top. Marshmallow [Corn Syrup, Sugar, Dextrose, Modified Corn Starch, Water, Gelatin, Tetrasodium Pyrophosphate- whipping aid, Artificial Flavor and the Artificial Color (FD&C Blue 1)], Milk Chocolate [Sugar, Milk, Cocoa Butter, Chocolate Liquor, Soy Lecithin (an emulsifier) and Vanillin (artificial flavor)] and Pecans. May contain Wheat, Milk, Peanuts, Tree Nuts, Soybeans and/or Eggs.